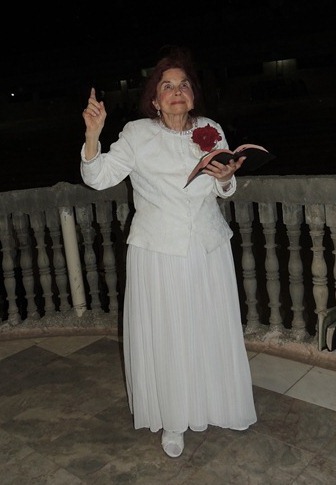 Recently Verna Linzey, a “daughter” of the Azusa Street Revival, was ministering in the Los Angeles Mission in Torrance when revival unexpectedly broke out with ecstatic utterances, prophecy, shaking and salvations, and this has continued at that mission. This weekend Linzey, author of The Baptism of the Holy Spirit, was invited to the Azusa Street Revival Commemoration called “Honoring the Holy Spirit for the Past and Seeking God for the Future,” an event coordinated by the Rev. Fred Berry. This event took place on Friday in the sanctuary at Union Church, which is on the back side of the square block shared by Azusa Street. Revival suddenly hit the Azusa Street Commemoration at the conclusion of the morning session. About 30 people came forward for the altar call. Among them, 17 received the baptism of the Holy Spirit as confirmed by speaking in tongues for the first time in their lives, including a 7-year-old girl, as Verna and her son, Jim, laid hands on them. Many shook under the power of the Holy Spirit with vehement quaking and gyrations as the Holy Spirit moved upon them. Some exhibited much body heat and sweating or shedding of tears under the anointing. Some asked for inner healing or guidance. A few men asked for generational blessings and wisdom to build upon the spiritual foundations established by their predecessors. Others wanted more of the Holy Spirit, anointing and influence to have a positive impact at work and in the ministry. Verna and Jim Linzey gave prophetic words, exhortations and discerning prayers over many people with the laying on of hands. The vast majority of them were Japanese. Upon approaching the premises of the Azusa Street Mission site before the event of day two began, the Holy Spirit hit again. Two native Chinese women who had come from Vancouver approached Verna Linzey and asked her to pray for them. Manifestations erupted with the speaking in tongues, tears and some physical movement. The service then began in which the large crowd, again mostly Japanese, broke into dancing before the Lord, shouting and singing, followed by testimonies. One was a testimony of the miraculous: After Friday’s event one woman had a dream that night of an angel. When she awoke in the morning she discovered a large angel feather had miraculously appeared as a sign and was resting on two of her ceramic angels. It appeared out of nowhere. She showed a photo of it at the meeting. Throughout the remainder of Saturday’s event the Holy Spirit was indeed strongly felt as much history was again shared about the historic revival and the site. Then a grapefruit tree was planted in memory of William Seymour’s legacy due to a historic grapefruit tree which used to be there. Berry has scheduled Verna Linzey to preach and minister at the historic Bonnie Brae Street house on Dec. 14 at 7:00 p.m. at 216 N. Bonnie Brae St., Los Angeles. Pentecostals and charismatics are praying for the flame of revival to continue hitting Los Angeles. Jim Linzey is asking Pentecostals throughout the world to host revival prayer meetings in their homes one night per week and invite others to meet with them and cry out to God, seek the face of God and to seek to know the Holy Spirit in an intimate way.